^ Stringer, C. (1984). "Human evolution and biological adaptation in the Pleistocene". In Foley, R. Hominid evolution and community ecology. New York: Academic Press. ISBN 978-0122619205. Holloway, R.L. (1985). "The poor brain of Homo sapiens neanderthalensis: see what you please". In Delson, E. Ancestors: The hard evidence. New York: Alan R. Liss. ISBN 978-0471843764. ; extending to 1,736 cm3 (105.9 cu in) in the male Amud 1. Amano, H.; Kikuchi, T.; Morita, Y.; Kondo, O.; Suzuki, Hiromasa; et al. (August 2015). 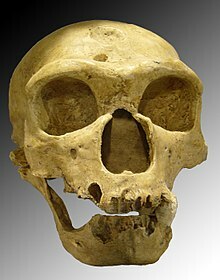 "Virtual Reconstruction of the Neanderthal Amud 1 Cranium". American Journal of Physical Anthropology. 158 (2): 185–97. doi:10.1002/ajpa.22777. hdl:10261/123419. PMID 26249757. ^ a b Kuhlwilm, Martin (17 February 2016). "Ancient gene flow from early modern humans into Eastern Neanderthals". Nature. 530 (7591): 429–433. Bibcode:2016Natur.530..429K. doi:10.1038/nature16544. PMC 4933530. PMID 26886800. ^ King, W. (1864). 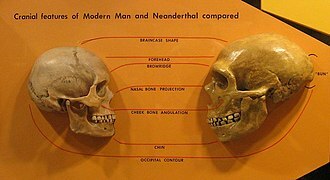 "On the Neanderthal Skull, or reasons for believing it to belong to the Clydian Period and to a species different from that represented by man". Report of the British Association for the Advancement of Science, Notices and Abstracts, Newcastle-upon-Tyne, 1863: 81–82. Retrieved 2018-10-21. ^ a b King, William (Jan 1864). 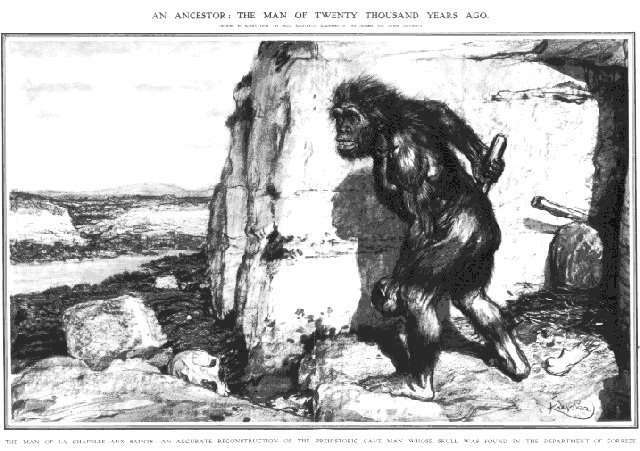 "The Reputed Fossil Man of the Neanderthal" (PDF). The Quarterly Journal of Science. 1: 96. ^ B. Vandermeersch; M.D. Garralda (2011). S. Condemi; G.-C. Weniger, eds. "Continuity or Discontinuity in the Peopling of Europe: One Hundred and Fifty Years of Neanderthal Study". Vertebrate Paleobiology and Paleoanthropology. Springer Netherlands. pp. 113–25. doi:10.1007/978-94-007-0492-3_10. ^ Fisher, Simon E.; Grabe, Hans J.; Macciardi, Fabio; Pääbo, Svante; Franke, Barbara; Hublin, Jean-Jacques; Pourcain, Beate St; Kelso, Janet; Manzi, Giorgio (2019-01-07). "Neandertal Introgression Sheds Light on Modern Human Endocranial Globularity". Current Biology. 29 (1): 120–127.e5. doi:10.1016/j.cub.2018.10.065. ISSN 0960-9822. PMC 6380688. PMID 30554901. ^ SINC Servicio de Información y Noticias Científicas (2011-11-07). "El cerebro neandertal era más asimétrico que el del 'Homo sapiens'". ^ Zanolli, Clément; Martinón-Torres, María; Bernardini, Federico; Boschian, Giovanni; Coppa, Alfredo; Dreossi, Diego; Mancini, Lucia; Martínez de Pinillos, Marina; Martín-Francés, Laura; Bermúdez de Castro, José María; Tozzi, Carlo; Tuniz, Claudio; Macchiarelli, Roberto (3 October 2018). "The Middle Pleistocene (MIS 12) human dental remains from Fontana Ranuccio (Latium) and Visogliano (Friuli-Venezia Giulia), Italy. A comparative high resolution endostructural assessment". PLOS ONE. Plos. 13 (10): e0189773. Bibcode:2018PLoSO..1389773Z. doi:10.1371/journal.pone.0189773. PMC 6169847. PMID 30281595. ^ Q., Ding (10 June 2014). "Neanderthal origin of the haplotypes carrying the functional variant Val92Met in the MC1R in modern humans". Molecular Biology and Evolution. doi:10.1093/molbev/msu180. ^ Watson, Traci (19 March 2012). "Were Some Neandertals Brown-Eyed Girls?". Sciencemag.org. Retrieved 8 March 2019. ^ "Palaeoecological and genetic evidence for Neanderthal power locomotion as an adaptation to a woodland environment". ResearchGate. Retrieved 2019-01-30. ^ Haeusler, Martin; et al. (25 February 2019). "Morphology, pathology, and the vertebral posture of the La Chapelle-aux-Saints Neandertal". Proceedings of the National Academy of Sciences of the United States of America. 116 (11): 4923–4927. doi:10.1073/pnas.1820745116. PMID 30804177. ^ Cassella, Carly (1 March 2019). "We Have Been Wrong About a Key Feature of Neanderthals' Appearance". ScienceAlert.com. Retrieved 1 March 2019. ^ Fiorenza, Luca; Benazzi, Stefano; Tausch, Jeremy; Kullmer, Ottmar; Bromage, Timothy G.; Schrenk, Friedemann (2011). Rosenberg, Karen, ed. "Molar Macrowear Reveals Neanderthal Eco-Geographic Dietary Variation". PLOS One. 6 (3): e14769. Bibcode:2011PLoSO...614769F. doi:10.1371/journal.pone.0014769. PMC 3060801. PMID 21445243. ^ Jaouen, Klervia; et al. (19 February 2019). "Exceptionally high δ15N values in collagen single amino acids confirm Neandertals as high-trophic level carnivores". Proceedings of the National Academy of Sciences of the United States of America. 116 (11): 4928–4933. doi:10.1073/pnas.1814087116. PMID 30782806. ^ Yika, Bob (19 February 2019). "Isotopes found in bones suggest Neanderthals were fresh meat eaters". Phys.org. Retrieved 19 February 2019. ^ Max Planck Institute for Evolutionary Anthropology (19 February 2019). "Neanderthals' main food source was definitely meat - Isotope analyses performed on single amino acids in Neanderthals' collagen samples shed new light on their debated diet". Science Daily. Retrieved 21 February 2019. ^ Luo, Shiyu; Valencia, C. Alexander; Zhang, Jinglan; Lee, Ni-Chung; Slone, Jesse; Gui, Baoheng; Wang, Xinjian; Li, Zhuo; Dell, Sarah (2018-11-21). "Biparental Inheritance of Mitochondrial DNA in Humans". Proceedings of the National Academy of Sciences. 115 (51): 13039–13044. doi:10.1073/pnas.1810946115. ISSN 0027-8424. PMC 6304937. PMID 30478036. ^ Pagani, Luca (13 October 2016). "Genomic analyses inform on migration events during the peopling of Eurasia". Nature. 538 (7624): 238–242. Bibcode:2016Natur.538..238P. doi:10.1038/nature19792. PMC 5164938. PMID 27654910. ^ Paabo, Svante (16 January 2014). "A mitochondrial genome sequence of a hominin from Sima de los Huesos". 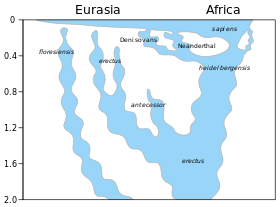 Nature (505): 403–406. ^ Cartmill, Matt; Smith, Fred H. (2009-03-30). The Human Lineage by Matt Cartmill, Fred H. Smith. ISBN 9780471214915. Retrieved September 27, 2015. ^ Bischoff, James L.; Shamp, et.al (2003). "The Sima de los Huesos Hominids Date to Beyond U/Th Equilibrium (>350kyr) and Perhaps to 400–500kyr: New Radiometric Dates". Journal of Archaeological Science. 30 (3): 275–80. doi:10.1006/jasc.2002.0834. Arsuaga JL, Martínez I, Gracia A, Lorenzo C (1997). "The Sima de los Huesos crania (Sierra de Atapuerca, Spain). A comparative study". Journal of Human Evolution. 33 (2–3): 219–81. doi:10.1006/jhev.1997.0133. PMID 9300343. Zilhão, João; Davis, Simon J. M.; Duarte, Cidália; Soares, António M. M.; Steier, Peter; Wild, Eva (2010). Hawks, John, ed. "Pego do Diabo (Loures, Portugal): Dating the Emergence of Anatomical Modernity in Westernmost Eurasia". PLOS One. 5 (1): e8880. Bibcode:2010PLoSO...5.8880Z. doi:10.1371/journal.pone.0008880. PMC 2811729. PMID 20111705. Lay summary – ScienceDaily (January 27, 2010). "Homo neanderthalensis". The Smithsonian Institution. 2010-02-14.